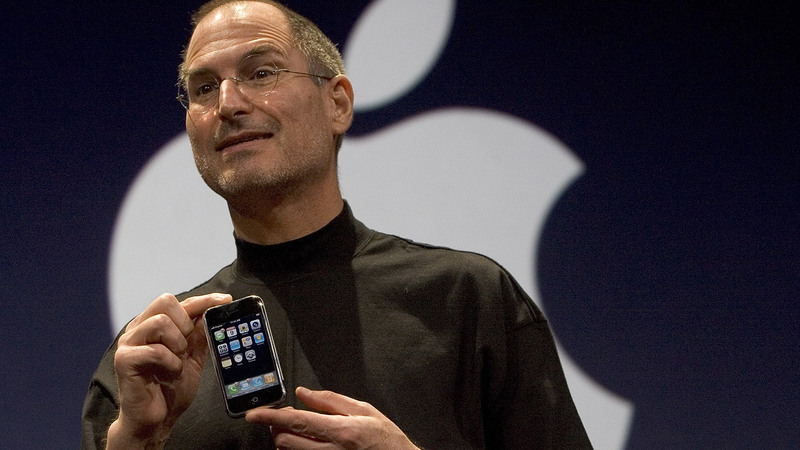 Steve Jobs reveals the iPhone in June 2007. The iPhone was the first time in my adult life that I saw my childhood notions of the future realized—and with good reason: it was (and still is) the future. 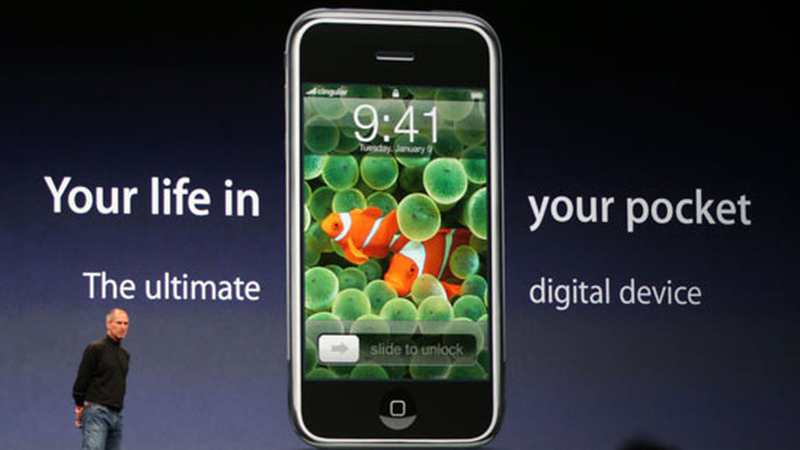 Ten years ago today, the first iPhones arrived in customers’ hands, catalyzing a huge set of changes that are still playing out. Android certainly shares the credit for everything that modern smartphones unlocked, but it was the iPhone that exploded the market, pioneered the new UI, created the app store, and even forced cell-network upgrades to support the new mobile era. The iPhone’s legacy is the smartphone legacy. Here’s what that legacy looks like. The iPhone was the first popular device to make it easy to browse desktop websites on a mobile device. Before the iPhone, the mobile web experience was hobbled by crummy WAP sites, weird trackball cursors, or lousy text-only experiences navigated by keypad. The iPhone’s huge (for the era) screen and pinch-to-zoom interaction made it possible to see the whole web from your phone for the first time. The iPhone released the web from its desktop prison. Suddenly we had more than one kind of screen to design for. The iPhone and the mobile explosion that followed was both opportunity and crisis. As an industry, we knew only how to pour services and content into one container at a time—each one purpose-built for a specific platform. As more and more devices and screen sizes arrived, however, we needed a new technique to make it manageable. Ethan Marcotte delivered that in the form of responsive web design in March 2010. The iPhone and its mobile mandate forced this deep change that has since transformed the method and perspective of web development. For over 30 years, we explored the digital world exclusively with these prosthetics called mouse, keyboard, and cursor. We nudged plastic bricks across our desks. We directed onscreen arrows to poke buttons from afar. We clicked icons. We pointed at pixels. But with the iPhone, millions and then billions of people suddenly started holding those pixels in our hands. The whole world now wrangles touchscreens every day, all day. We now touch information itself: we stretch, crumple, drag, flick it aside. The design of digital interfaces is no longer just how a design looks but how it feels in the hand. If the iPhone (and responsive design) jolted the industry with the simple truth that the web is not limited to a single output (the desktop screen), it also introduced another revelation: computing is not limited to a single input, either. Touch was the first wildly popular alternative to the mouse/keyboard monolith, but the iPhone and other smartphones have continued to introduce even more inputs, too. Mobile has normalized an intricate choreography of inputs that include camera, audio, GPS, natural gesture, and more. Once upon a time, applications used to be these gray, dreary affairs imposed upon you to do your mundane day-to-day chores. They were the stuff of spreadsheets and word processing and database records. The Web 2.0 era began to infuse software with more personality, but the iPhone blew it open and brought the idea of “apps”—truly personal software—to the masses. The iPhone made mainstream the idea that software could be fun, expressive. It changed the tone of digital interfaces. No gizmo or gadget has ever inspired as much affection as the iPhone in its first years. The iPhone was the first truly personal computer—and not only because it was a beautiful little totem that was always with you. It was also a device that knew so much about you, even about what was around you or nearby. And it was awash in colorful and fun apps that you personally selected, curated, cared for. In those days, your home-screen icons said as much about you as the contents of your handbag, the clothes you wore, or the bobbleheads decorating your desk. With Siri, the iPhone even made the device itself a personality, with the first widespread voice interface. Talking to machines is quickly becoming commonplace, and that trend first became truly popular on iPhone. “There’s an app for that.” When the app store arrived in 2008, nearly anything you could imagine could suddenly be delivered in tidy, cheerful packages called apps. For years, phone makers had been trying to make phones behave like computers. Apple’s breakthrough was in choosing to make a computer first, reducing the phone itself to an app (and the device’s least interesting app at that). And then everything else became an app, too. Smartphone apps absorbed and replaced cameras, paper maps, music players, flashlights, GPS gadgets, radio. “Software is eating the world,” Marc Andreessen wrote in 2011. It was the iPhone that cut the world up into tiny, tasty bites—obsoleting entire industries and devices along the way. Your life? There’s an app for that. The iPhone has never been a “phone,” not really, but it’s always been a communicator. One of the reasons it’s so powerfully addictive is because it’s a portal to all the people we care about. Text and photos are the essential creative units of mobile devices, perfect for constant sharing of thoughts and activity. It’s no accident that social-media properties skyrocketed with the arrival of iPhone, but it also became an ideal container for more private conversations via technologies like Facetime, too. iPhone popularized the idea of computer as capsule for relationships both strong (family) and weak (twitter followers). The arrival of a capable networked mobile computer suddenly made the world’s information available at a whim. Now we can act on immediate impulse to get information or media or services or commerce. Snap that photo, record that conversation, consult that map. This superpower is also mobile’s Achilles’ heel. Because the phone is available at the point of inspiration, it also carries us away from the very thing that inspired us. The more connected we are, the more disconnected we become from the world around us. It turns out that the lure of on-demand information, play, and distraction is irresistible. On average, we spend nearly 20 percent of our waking hours staring into these tiny rectangles. I can’t help but think: maybe we mobile designers have done our jobs a little too well. And maybe “engagement” was the wrong goal to chase in the first place. Instead of pulling us into our screens at the moment of inspiration, certain smartphone interactions encourage engagement with the world. The iPhone introduced and popularized sensor-based computing, direct interactions between your phone and your immediate environment. It began with simple location-based computing to tell you who or what was nearby. But it soon morphed into something more powerful: making sense of what’s right in front of you. Remember the first time you saw Shazam identify a song? Or Google Translate transform a sign in your phone’s camera viewfinder into a different language? Or see a Pokemon materialize on the sidewalk? Now that iOS 11 is about to bake an augmented-reality platform (ARkit) into the operating system itself, we may uncover still more new ways to interact with the point of inspiration. With the steady march of machine learning and artificial intelligence, computers are getting better and better at making sense of the world immediately around us. Smartphone sensors are the funnels that gather that immediate data, and the iPhone was the device that made this feel… normal. The iPhone should be remembered as the first mainstream internet of things device: a mundane object lit up with smarts thanks to a processor, a connection, and sensors. The phone has become the everyday bridge between digital and physical. The iPhone changed the way we experience the world and each other—for better and for worse—and its story isn’t done. As these tiny computers get more powerful and gather/share more data, they’ll become even more deeply intimate and more revealingly public—our tiny but far-seeing windows into the world and ourselves.